GST, the biggest tax reform in the country, will undergo another major revamp w.e.f. April 1, 2019. While the 27th GST Council Meeting approved Simplified Returns, the 28th GST Council Meet laid down the rules on Return Simplification. After this, return forms: GSTR 2 and GSTR 3 were suspended due to their complex structure and GSTR 1 and GSTR 3B were retained. 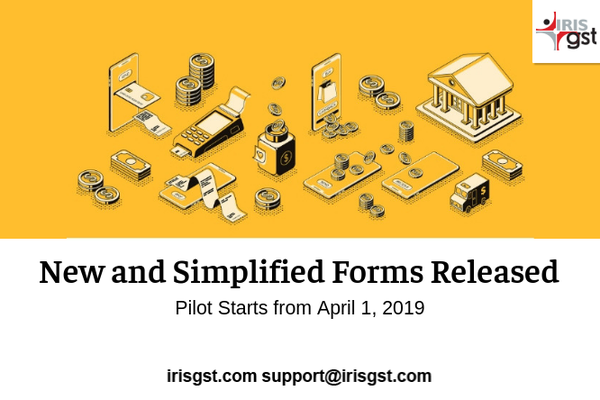 The transition to new simplified forms was divided in 3 phases, last being avilability of Simplified Returns on the portal, and few days back, the Simplified Returns were released on the GSTN portal. The pilot starts from April 1, 2019 which shall be made mandatory from July 1, 2019. These tax returns are being introduced to free the small taxpayers from the hassles of taxation, thereby helping them to focus on the growth of their business. Who are small taxpayer in GST Regime? Business owners with an annual turnover up to Rs.5 crores are considered as Small Taxpayers. What is the periodicity of these return forms? Can a newly registered taxpayer opt in to file Sahaj or Sugam return forms? For a newly registered taxpayer, turnover will be considered as zero and hence he/she will have the option to file monthly, Sahaj, Sugam or Quarterly (Normal) return. Can I change the periodicity of my return filings? Change in the periodicity of the return filing (from quarterly to monthly and vice versa) would be allowed only once at the time of filing the first return by a taxpayer. However, if a Taxpayer is filing his return as Sahaj, he can switch over to Sugam or Quarterly (Normal) return more than once in a financial year. Such taxpayers may make nil rated, exempted or Non-GST supplies, which need not be declared in the said return. Taxpayers opting to file monthly return or Quarterly (Normal) return shall be able to declare all types of outward supplies, inward supplies and take credit on missing invoices. What are the advantages of the Simplified Return Forms? The taxpayer shall be able to upload invoices to the GST Portal 24x7. The recipient would be able to accept or reject the invoice in real-time. For monthly basis: The recipient shall be eligible to take credit in his return based on the documents uploaded by the supplier up to the 10th day of the filing, irrespective of whether the supplier files his return on the monthly or quarterly basis. For quarterly basis (Normal, Sahaj or Sugam): The recipient shall be eligible to take credit in his return based on the documents uploaded by the supplier up to the 10th day of the filing month, irrespective of whether the supplier files his return on monthly or quarterly basis. It is being anticipated that these return forms shall greatly simplify the taxation system in India, reduce the tax burden from businesses and help eliminate tax evasion in the country. For further updates on the simplified tax return forms, keep an eye on the IRIS Blog. Read the comparative analysis of the current and upcoming taxation scenarios here.